If one picture can display the long-term growth of the U.S. economy and the power of long-term equity investing, it is the chart below. The chart is compiled from more than 200 years of asset class returns data by market legend, and professor of Finance at the Wharton School of Business, Jeremy Siegel. 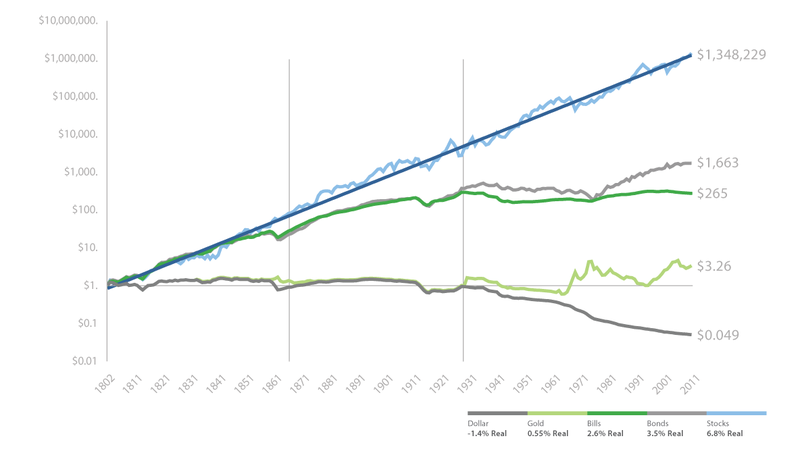 In his 2014 updated edition of his classic investing tome, Stocks for The Long Run, Siegel shows the long-term growth of equity market returns, net of inflation, over the last 212 years. It is quite striking to see that the average annual stock market return over that long period of time, net of inflation, is 6.8 percent, vs. 3.5 percent for bonds, 2.8 percent for Treasury Bills, 0.55 percent for gold and -1.4 percent for the Dollar. If you had invested a Dollar in stocks in 1802, you would have $1.3 million today. If you had kept that Dollar in cash, you would have 5 cents today. Any questions? The stock market was recently at an all-time high. While this fact worries some investors, what an all-time high demonstrates though, is this: that we have made it through every correction, recession, depression, world war, Watergate scandal, dust bowl, oil embargo and civil war, we have recovered, and have then gone on to new market highs. A full 100 percent of the time. That is a pretty good record. Sure, there are some wiggles, gullies and hiccups in the long-term equity market growth chart, such as severe recessions, economic malaise and political scandal. And the stock market does not rise in a straight line. But our economy and people have always persevered and prospered on the other side of difficult times. With such a solid record of long-term growth, the only mistake one could make over time is to sell stocks, hoping to jump back in when the smoke clears. If you want to bet against a 100 percent record, be my guest. History suggests you will be wrong. In the long-term march upward for the stock market, there will always be difficult economic and stock market periods, but they are like the seasons. During this past winter here in Texas, the trees were bare and seemed dead. They were not dead, however, and we didn’t dig them up to look at the roots to see what is wrong or cut them down hoping to replant them in warmer weather. We waited, knowing that 100 percent of the time, winter turns to spring, and nature comes alive again. Similarly, the economy and stock market have seasons. Recessions and corrections are usually short and dark, but then the economy blooms again, as it always has. Population growth: With babies born every year, and healthy immigration numbers, the number of consumers and productive members of the economy increases every year. Productivity increases: As technology evolves, so does our ability to create more output with less work. American GDP per capita is now about $56,000. In real terms — that’s a staggering six times the amount in 1930. U.S. citizens are not intrinsically more intelligent today, nor do they work harder than did Americans in 1930. Rather, they work far more efficiently and thereby produce far more. And with all the angst about the fear of robots stealing our jobs, we stand here in 2018 at record low rates of unemployment. Our economy constantly evolves and changes. New industries are invented and rise, while other less productive industries die off. Amazon rises, while Sears falters and fades away. Uber becomes dominant, while taxi drivers lose their rides. Expedia.com becomes dominant, while travel agents retire. Our economy is dynamic and ever-changing, and capital flows where it is treated best. It has been said that there are no pessimists on the Forbes 400 list of the richest Americans. The United States has the most ambitious, entrepreneurial, hard-working, productive, risk-taking and optimistic workforce in the world. Millions of new businesses are created every year, by people with a good idea, hoping to build a better mousetrap, and a better life. Although the United States has been reported to be “going down the tubes” by every generation over the last 242 years, it has never paid to bet against us. In “chart lingo,” the history of the U.S. economy and the stock market has been “up and to the right.” The future is as well. The information contained herein represents the views of Westwood Holdings Group, Inc. at a speciﬁc point in time and is based on information believed to be reliable. No representation or warranty is made concerning the accuracy or completeness of any data compiled herein. Any statements non-factual in nature constitute only current opinion, which is subject to change. 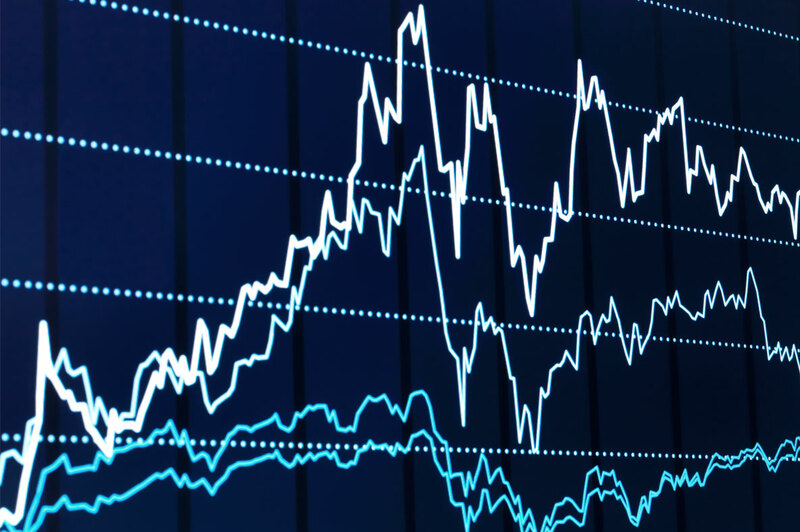 Any statements concerning ﬁnancial market trends are based on current market conditions, which will ﬂuctuate. Past performance is not indicative of future results. All information provided herein is for informational purposes only and is not intended to be, and should not be interpreted as, an offer, solicitation, or recommendation to buy or sell or otherwise invest in any of the securities/sectors/countries that may be mentioned.